Normally as soon as the beautiful weather appears, I like to banish the black and the wool from my wardrobe. Even if I end up chilly by the time the sun goes down, I would rather wear something to suit the sunny skies. Not to mention the fact that the winter-appropriate side of the closet gets tiresome after a few months, no matter how much I may love certain items contained therein! 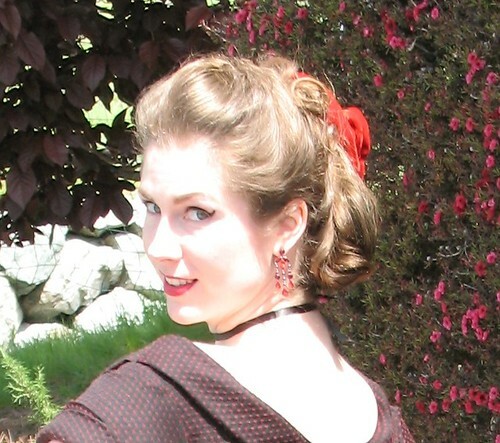 So even though I am going to do my best to wear Spring things from here on out, I managed to finish my Ceil Chapman dress in time for Marin Symphony’s latest concert, and I really wanted to take her out for a spin before the heat made it impossible to wear a black wool dress. It actually turned out to be quite comfortable for April weather with the short sleeves. The concert was magnificent, by the way! And an evening of Carmina Burana and Chichester Psalms somehow seemed like the proper event to debut this dress. The issues with the invisible zipper on my latest Britex project gave me the courage to fix the zipper on this dress. And as a few of you mentioned, the problem was actually solved with minimal fuss. The most irritating part was picking out black thread on black wool. Thank goodness for that organza strip I used to stabilize the zipper, or else I might still be going at it with a seam ripper. It really feels good to have finished this dress. I am not a complete failure! Whoo-hoo! Not only can I now zip the dress up, I can do so all by myself! All it needed was a sturdy standard zipper! This dress is so lovely and you did a wonderful job! It's gorgeous and you look fantastic in this dress! So glad to see it finished and in action! Beautiful! Great job with that tricky pattern. I'm a big Spadea fan, so I loved seeing that particular Ceil Chapman pattern made up. So very pretty - what a wonderful pattern. I am glad it came into your hands. It's sooooo beautiful! Looks stunning on you...I just adore all the details about the dress!! YAY! Stunning! The bodice is incredible, excellent work! Oh, you are SO elegant! I'm so glad the zipper worked out, this dress just has to be worn to death! Gobsmackingly beautiful! Well worth the effort you took. Congratulation on such an elegant make. Ooolala! I'm so happy you were able to fix the zipper and take this dress out for a spin before the warm weather settles in. It's GORGEOUS. This is truly spectacular!! The fit is spot on. 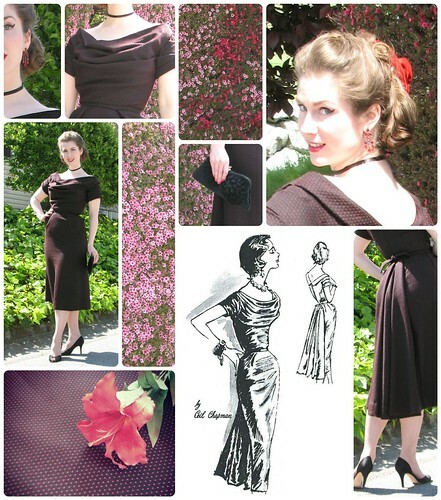 I so enjoyed seeing the progression to the finished garment, Laura Mae! I not only read all your posts. I print them and they have their own binder. You are just darling to look at all dressed up in matching shoes, purses and hats. You are more beautiful than most celebrities and your style is more classy and unique than all their money can buy for them. I have one question. How do you calculate and taper the lovely hemlines for your clothes? I like the way you make the hem longer in the back. I can see you have hemlines several inches longer in the back on full-skirted vintage garments and not much longer on A-line skirts, but could you share in detail how you achieve elegant hemlines? I notice your hemlines as much as any other aspect of your clothes. Wow! This is stunning! And I hear ya on the seasonal color palette, I too am like that. That dress is simply stunning on you my dear!!! Absolutely gorgeous - the fit and silhouette are just perfect. Glad you got to wear it before the weather warms up! Absolutely gorgeous! The drape of the fabric is splendid, and the pleats ended up looking lovely! Wow. The dress looks absolutely fantastic on you! The colour and the style. This is a wonderful design, beautifully executed. So glad you were able to resolve the zipper issues, this dress deserves to be seen. I'm surprised the orchestra didn't give you an ovation! When it appears scientifically impossible, you have once again outdone yourself. Congratulations on this wildly successful scene stealer. Bravo! The dress is stunning - and very chic. The back interest on that dress is swoon-worthy! This dress turned out beautifully! I hope you have lots of opportunities to wear it.